At QASymphony, we work with a lot of customers who use Atlassian software like JIRA, Bamboo, HipChat, etc. So we’ve done a lot of work to make sure that our solutions work well with Atlassian solutions. We want to make it easy for development and testing teams work across different the applications. We recently added some exciting new add-ons to the Atlassian Marketplace along with some of our classics. If you are using QASymphony and Atlassian software together, these add-ons can help you get more efficient and effective. Our qTest plugin for Bamboo allows you to create your builds in Bamboo and send your JUnit test results directly to qTest as test runs and test logs. Test Case Creation: With qTest for Bamboo, test cases are automatically created for all JUnit tests executed against a build. Export Test Results: Easily export the JUnit test execution results to a spreadsheet in order to view the data and create custom reports from qTest side. Install the FREE qTest for Bamboo add-on here. qTest Scenario for JIRA is the first add-on that supports the end-to-end workflow for BDD, TDD, and ATDD in JIRA. qTest Scenario allows you to work faster, bring testing further up in the process, increase tester productivity, solve problems in real-time, become more focused on the end user, and scale Test-First methodologies across your organization. Feature and Scenario Development in Gherkin: With qTest Scenario’s built in Gherkin editor, you can build your features and scenarios directly in the add-on. Additionally, you can use your existing setup and easily import and export feature files. 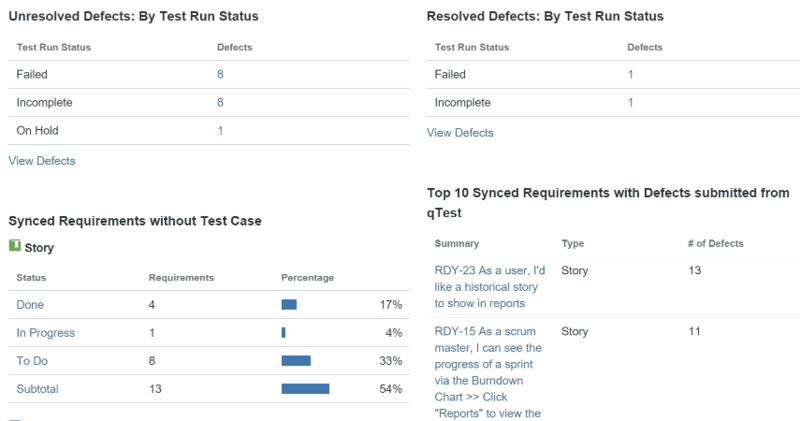 Visibility from Development to Testing: The entire organization is able to see progress of the testing within each sprint or release. Traceability is automatically created to make the connection between user stories, tests, results, and defects found. Learn more about qTest Scenario for JIRA. The qTest for JIRA Cloud add-on offers high level reports of integrated data between your JIRA project and qTest. Easy access from JIRA project: The widget link resides in your JIRA project. It provides high level reports of integrated data between JIRA project and a qTest project. 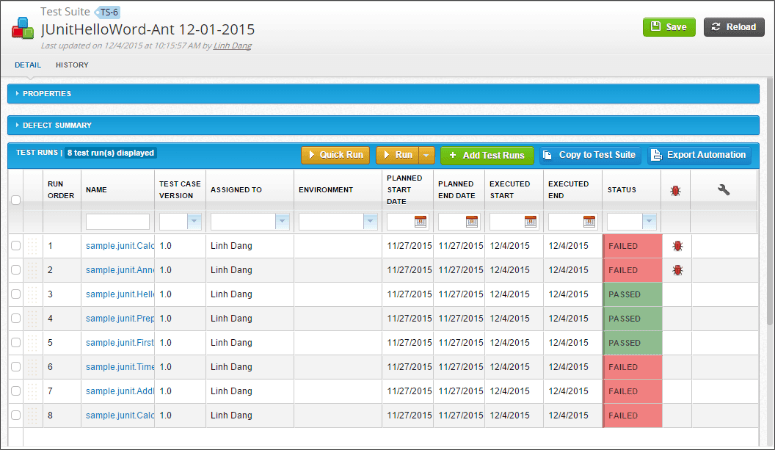 Drill down reports: Each high level report has its own drill down one. You can export the drill down reports to Excel files for reporting purposes. If you are currently using qTest and JIRA Cloud, make sure you download this add-on here. The qTest for JIRA Server plugin offers real-time integration at both the requirements and defect levels for making it easier to do Test Management in JIRA. 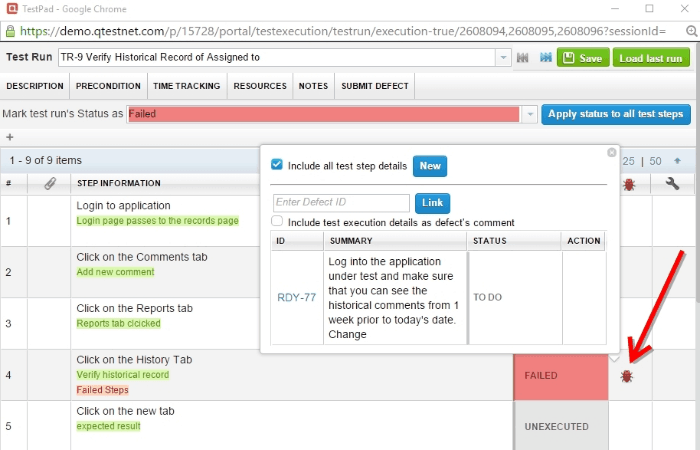 Native Defect Integration: Submit defects to JIRA while executing a test case in qTest. The add-on also also auto-populates JIRA field values with qTest data through browser automation. Requirement Integration: Easily map JIRA requirement tickets to qTest requirement objects without complicated configurations. Simple Project Mapping – No Scheduled Sync: Forget complex, and frustrating permission field mapping. Users can freely select which project(s) and JIRA issue type(s) to map into qTest. If you are currently using qTest and JIRA Server, make sure you download this add on here. If you want more detailed information on any of our Atlassian add-ons, visit the QASymphony Support Community. If you are a current Atlassian customer but not using qTest, click here to contact one of our experts. We can show you how to get more value out of your Atlassian software.